The 2013 Mussels of the Month. The December 2013 Mussel of the Month is Plethobasus cyphyus. Plethobasus is a genus of three species in the Interior Basin of Eastern North America. Plethobasus cyphyus is called a bullhead by those who think mussels are fish or a sheepnose by others who wish it was a part of a mammal. We prefer to use the lingua franca of scientists, so we go with P. cyphyus. For a freshwater mussel that is protected at the federal level as well as several states, it has not been the focus of much peer-reviewed research. Our friend, Dr. Kevin Roe, has made progress toward understanding the phylogeography of Plethobasus cyphyus, and the Hove Lab has reported on the host fishes. But more data are needed — the IUCN Red List species account hasn't been updated since 1996! Otherwise, it is mentioned as part of phylogenetic studies (Campbell & Lydeard, 2012) or in various stream surveys (e.g., Fisher, 2006). We wish there was more for us to say, but the best we can do right now, Gentle Reader, is refer you to Butler (2002). The October 2013 Mussel of the Month is Ptychorhynchus pfisteri. Ptychorhynchus is a genus of three species found in China and southeastern Asia. It has been a busy week, and weeks like this are when we roll out a Mussel of the Month, like Ptychorhynchus, about which we know absolutely nothing. Less to say, so there is less to write. Google Ptychorhynchus and see what you find: mostly this web site and the suggestion that you might mean "Pachyrhynchus." Ptychorhynchus pfisteri does have a Red List page. That's something. It is ranked as Near Threatened. Our classification for this species is a guess. The Russian Comparatory School (e.g., Bogatov et al., 2003) wants to classify this mussel in the Margaritiferidae. The September 2013 Mussel of the Month is Ellipsaria lineolata. Ellipsaria is a monotypic genus of eastern North America. Although regarded as a monotypic genus, Ellipsaria tends to land near Truncilla in phylogenetic studies (Campbell et al., 2005; Zanatta & Murphy, 2006). This is perhaps not too surprising. According to Ortmann (1912), the two genera differ in the size of their glochidia. While the larvae of Ellipsaria are "very large," those of Truncilla are "extremely small." Otherwise, characters of their soft-anatomy are similar. We ran into a few "butterflies" while sampling on the Mississippi River earlier this summer. Though not Federally listed in the United States, E. lineolata is protected at the state level in Wisconsin, Minnesota, and Iowa in the Upper Midwest. The August 2013 Mussel of the Month is Aculamprotula fibrosa. Aculamprotula is a genus of five species in eastern Asia. We are going to use this month's mussel as an angle to discuss two advances for the MUSSEL Project: 1) the beginning of our 2nd decade of the Mussel of the Month and 2) a new publication on the classification of Asian freshwater mussels. This month, August 2013, marks the 10 year anniversary of our first Mussel of the Month, Lamproscapha.We look forward to providing this valuable and aesthetically pleasing service for at least another 120 more months. To commemorate this milestone, we have made a poster. We have chosen Aculamprotula this month in honor of the latest MUSSELp publication, "Re-analysis confirms the polyphyly of Lamprotula Simpson, 1900 (Bivalvia: Unionidae)" by Pfeiffer & Graf in the Journal of Molluscan Studies. The handful of species classified in Aculamprotula were, until recently, placed in Lamprotula. Back in the 1990s, it was discovered that while some species of Lamprotula brood in all four demibranchs and have unhooked-type glochidia, others brood in only the outer demibranchs and have hooked-type glochidia. These are characters diagnostic of different freshwater mussel subfamilies. The genus Aculamprotula was created for the latter species, with A. fibrosa as the type species (Wu et al., 1999). It was the molecular phylogeny published by Zhou et al. (2007) that determined which species belong in Aculamprotula and which should remain in Lamprotula. However, that study left us with more questions than answers, and former-Bama graduate student John Pfeiffer was tasked with resolving the issue. It turns out that while Pfeiffer & Graf (2013) were able to answer some of the unanswered questions (such as the subfamilial classification of Lamprotula s.s.: Gonideinae), the species circumscriptions of the two genera and even their correct names are not yet clear. So, enjoy the name Aculamprotula while it is still considered valid! And, congratulations to John M. Pfeiffer III on his first publication! The July 2013 Mussel of the Month is Micronaias fallaciosa. Micronaias is a genus of three species, endemic to Nicaragua in Central America. Micronaias is just one of 21 unionid genera known from Central America. As we have pointed out before when discussing Arotonaias, Barynaias, Friersonia, Nephronaias and Psoronaias, the Neotropical Unionidae are poorly known. If you are looking for a frontier of freshwater mussel research, where jack-diddly-bupkis is known, you need look no further than Micronaias and its kin. For example, do a Google Scholar search for Micronaias.You will find our global checklist (Graf & Cummings, 2007), and the next most recent reference will be a type catalog from the ANSP in the early 1970s (Johnson & Baker, 1973). If you want to learn about Micronaias, you need to go to the last "revision" of Mesoamerican unionids: Frierson (1927; largely duplicated in Haas, 1969). And then, you will learn that this mussel has a name. We we learn something more, we will get back to you. The June 2013 Mussel of the Month is Westralunio carteri. Westralunio is a genus of three species found in Western Australia and New Guinea. Westralunio carteri is endemic to southwestern Australia, and this freshwater mussel is the only species found in that area. Intestestingly, the other two species of Westralunio are far away in New Guinea. The occassion for crowning Westralunio carteri as Mussel of the Month for June 2013 was inspired by the recent paper by Klunzinger et al. (2013). W. carteri, like other hyriids, has hooked-type glochidia. Among freshwater mussels, there are, in fact, two different kinds of hooked-type glochidia: those of the Hyriidae and those of the unionid subfamily Unioninae. This is a case of convergent evolution, presumably for attachment to their hosts' fins rather than their gills. (Watch this space to find out more John Pfeiffer's results with a third example of this phenomenon). Michael Klunzinger has moved our understanding of Westralunio carteri forward a great deal with his dissertation on the ecology, life history, and conservation status of this species. Good work, Michael! The May 2013 Mussel of the Month is Leptodea fragilis. Leptodea is a genus of three species in eastern North America. Leptodea fragilis has been on our minds recently, and so we have decided to finally honor it as a Mussel of the Month. We were recently reminded that Leptodea fragilis is a weird outlier when it comes to fecundity and glochidium size. Compared to most other amblemines, L. fragilis produces many, many tiny glochidia. This species (and many others) are discussed in an excellent new review paper by Wendell Haag (2013). Leptodea fragilis was also featured in work done by students of the Graf Lab at the University of Wisconsin-Stevens Point. Two posters were presented at the College of Letters and Science Undergraduate Research Symposium: "Curation of the Daniel J. Bereza Collection of freshwater mollusks at the Smithsonian National Museum of Natural History: Phase I" by Caitlin Luebke, and "A preliminary study of the biogeography of freshwater mussels (Bivalvia: Unionidae) in Wisconsin, USA" by Ryan Pappas. Leptodea fragilis came up as one of those odd mussel species that straddles the Interior-Great Lakes divide in the Wisconsin and Fox rivers. The specimen figured here was collected by F.C. Baker (1928) on the Lake Michigan side. There is an interesting post-glacial biogeographical story that needs to be explored here! The April 2013 Mussel of the Month is Corbicula fluminea. Corbicula is a genus of freshwater bivalves in the family Cyrenidae that could have as many as 90 valid species. The genus has been widely introduced but its native range covers Africa and much of Asia. Corbicula is not a freshwater mussel. We know that. But it is still an interesting freshwater bivalve. Moreover, 1 April provides an opportunity to whoop it up and think outside the box for a bit. Corbicula is well known as an invasive freshwater bivalve worldwide, including North America. Compared to other freshwater bivalves, the genus is distinctive for lots of reasons, not the least of which is the prevalence of androgenetic reproduction (Hedtke et al., 2011). For this non-mussel Mussel of the Month, we will focus on our evolving understanding of the species-diversity of the genus. Beginning in the late 1970s, it was hypothesized that there were only two species of Corbicula on Earth. All freshwater species were considered C. fluminea, and the brackish populations were classified as C. fluminalis (Morton, 1979, 1986). That paradigm definitely simplified classification of the North American invasive species: C. fluminea. The two-species hypothesis was supported by the finding that the allozymes of putative Corbicula species in Thailand were little diversified (Kijviriya et al., 1991). 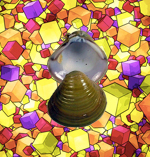 and, a great deal of conchological variation. The collapse of the predominant taxonomic theory for Corbicula leaves us in a bit of an information vacuum. Our current list for the genus Corbicula relies by necessity on dated and provincial revisions too numerous to cite here. We suspect that our current tally of 89 Recent species will change as more information becomes available. But, whether the number will go up or down, we aren't really sure. The March 2013 Mussel of the Month is Anodontoides ferussacianus. Anodontoides is a genus of three species restricted to eastern North America. When we think about Anodontoides ferussacianus, our minds go to the post-glacial dispersal of freshwater mussels in the Interior and Great Lakes basins of North America. Everything about the biogeography of this mollusk suggests it was one of the earliest aquatic colonizers in the wake of the wasting Wisconsin glaciers. The last round of Pleistocene glaciation (known as the Wisconsin) reached its zenith around 15,000 years ago. As the ice melted, gigantic though short-lived ice-contact lakes formed, and their discharges often breeched current drainage divides between the Great Lakes, Hudson Bay, and Mississippi basins. Since the existence (if not timing) of these glacial lakes became known to freshwater malacologists, ancient confluences have been invoked to explain mussel distributions. Graf (1997a, 2002) argued that the ancient glacial lake card had been overplayed and that later stream captures were responsible for moving more mussel species across drainage divides. However, one mussel fauna consisting of nine species is widespread north and south of the maximum extent of Wisconsin glaciation. Those ubiquitous species (Anodontoides ferussaciacus included) probably represent the earliest mussel community in the formerly glaciated portions of North Dakota, Minnesota, Wisconsin, Michigan, and Canada. It is interesting to note that those nine species (Anodontoides ferussacianus, Lampsilis cardium, Lampsilis siliquoidea, Lasmigona complanata, Lasmigona compressa, Ligumia recta, Pyganodon grandis, Strophitus undulatus, and Utterbackia imbecillis) are all long-term brooders. That is they are all bradytitic. Tachytictic short-term brooders arrived latter. The longer growing season for bradytictic mussels was hypothesized by Graf (1997b), in the exuberance of his youth, to be a factor in their successful northward range expansion. The February 2013 Mussel of the Month is Radiatula crispisulcata. Radiatula is a large genus of 17 species, distributed from India to southeast Asia. A few years ago, we didn't recognize Radiatula as a valid genus. Rather, we followed previous authorities by treating Radiatula as a subgenus of Parreysia (e.g., Subba Rao, 1989). Furthermore, we used to be fuzzy about the phylogenetic position of Parreysia relative to the other unionid genera. We "punted" and just put most of the tropical taxa in a big group called "incertae sedis Old World unionids" (Graf & Cummings, 2007). Click here to go back in time and see the old classification applied on this web site. The situation changed once we had some phylogenetic data. Whelan et al. (2011) demonstrated not only that Radiatula was distinct from Parreysia, but the two taxa are found in distinct lineages of a large clade of Indian and African taxa. Based on their phylogeny, we recognize four tribes in the subfamily Parreysiinae: Parreysiini, Lamellidentini, Oxynaiini, and Coelaturini. Parreysia (obviously) was recovered in the Parreysiini, but Radiatula came out in the Oxynaiini. This is an exciting result, but there is still more work to be done. Most significantly, Whelan et al. (2011) only examined a single species of Radiatula, R. bonneaudii. It remains to be seen whether the traditional circumscription of Radiatula is monophyletic. In the absence of a definitive test, we are stuck extrapolating from the meager data that are available. The January 2013 Mussel of the Month is Pegias fabula. Pegias is a monotypic genus endemic to the Cumberland Plateau of North America. Pegias fabula, also known as the littlewing pearlymussel, was historically widespread on the Cumberland Plateau. It was never frequently encountered, presumably due to its small size and habit of prolonged burial (Williams et al., 2008), but it was known from the Cumberland and Tennessee rivers in 5 states. Today, it is only known from four localities in Kentucky and Tennessee (Cummings & Cordeiro, 2012). As a result, P. fabula is listed as endangered by the U.S. Fish and Wildlife Service and critically endangered on the IUCN Red List. As anyone that follows modern mussel research knows, the case of P. fabula is not an isolated one. According to Williams et al. (1993), of the 300 species of mussels that were once present in the United States and Canada, c. 70% are either extinct (21 species), endangered (77 species), threatened (43 species) or of special concern (72 species). The Fish and Wildlife Service maintains a website listing many of these threatened and endangered species. A variety of factors have contributed to the decline of freshwater mussels in North America, including water pollution, habitat fragmentation and over-exploitation (Haag, 2009). However, if you follow the modern mussel literature, you will also be aware of the heroic efforts going on to reverse this trend. We have reported on the reintroduction of other endangered freshwater mussels on this site (e.g., Lampsilis, Epioblasma), and we look forward to providing a future update on Pegias fabula.